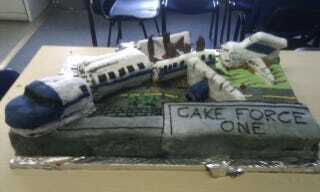 This cake featuring a crashed Air Force One is based on a game David Braben's Frontier Developments is making. Their most recent work was the toss-frisbees-at-cute-tigers game Kinectimals. But could this be Braben's reminder of something thought lost, something cooler? Before Kinectimals, before the LostWinds games for the Wii, back in 2005, Braben got a cover story on the magazine Edge to promote an amibitous game called "The Outsider." The Outsider was to be a political thriller with an unusually malleable storyline. The game was going to be more cutting edge in gameplay than BioShock. It was going to advance the way interactive stories are told. Braben wasn't some amateur making these claims. The man co-developed the legendary game Elite. "The game radically enriches the player's experience by abandoning the traditional, prescriptive, mostly linear story of current generation games, and replaces it by simulating characters' motivations and aims. This gives the player genuine freedom to change the story outcomes in a way that has not been seen before - each player will get a truly unique, sophisticated, visceral experience rather than simply switching between 'good' or 'evil'. The techniques used are enabled by the greatly increased processing power available to the imminent new consoles including the PlayStation 3 and Xbox 360. "The Outsider is a gripping, high-tech thriller played out against the backdrop of a living, crowded city based on present-day Washington DC and its environs including the CIA HQ at Langley, Andrews Air Force Base and Newport News Naval Dockyard. As a CIA operative the player has a mouth-watering arsenal of technology, combat talents and weaponry available to him. A shocking opening scenario wrongly makes him Public Enemy Number One in the eyes of the media and the public at large, but leaves many different ways to proceed: to wreak ultra-violent revenge, to turn the tables and exploit the shady organisations he is mixed up with for his own ends or crusading to clear his name." Not only does that game concept still sound interesting, but it sure sounds like the kind of game that would feature a crashed Air Force One, the personal jet of the President of the United States. The Outsider never came out and has been lost in some sort of development limbo, it seemed. What's the cake mean? For once, the cliched gaming joke about whether the cake is a lie seems appropriate.